ONLINE POSTER SALES IS NOW OPEN. We will have a limited number of posters for sale at the Creature Weekend Conference this year. See you at the conference! ***PLEASE NOTE THAT WE DO NOT SHIP POSTERS. All Posters ordered online will be available for pick up only at the 2018 Creature Weekend Conference held on October 26-28, 2018 at Salt Fork State Park Lodge. If you purchased a Gold Weekend Pass or a ticket for the Friday Night Dinner with the Speakers, this poster is included with your ticket. This poster will only be available for sale online until October 1, 2018. ONLINE T-SHIRT SALES IS NOW OPEN. We will have a limited number of T-Shirts for sale at the Creature Weekend Conference this year. See you at the conference! ***PLEASE NOTE THAT WE DO NOT SHIP T-Shirts. All T-Shirts ordered online will be available for pick up only at the 2018 Creature Weekend Conference held on October 26-28, 2018 at Salt Fork State Park Lodge. These T-shirts will only be available for sale online until October 1, 2018. The Official 2018 Creature Weekend T-Shirt will be available for sale at the Creature Weekend Conference in very limited quantities. If you want to be sure that we have your T-shirt size, order online! 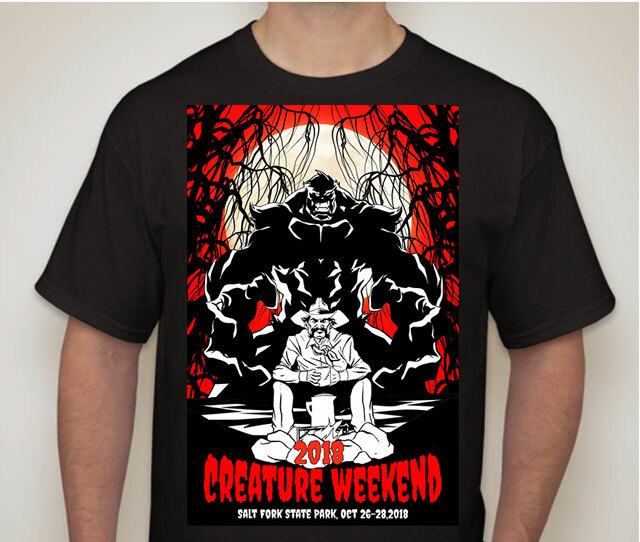 ***Please note that the T-shirt version of the Creature Weekend logo is slightly different than the Poster.